Skill level: Intermediate Bladesmithing and / or Blacksmithing skills required! The sword is an object of power. The sword conjures images in our minds of Knights thoughts of chivalry of kings and heroic deeds in ages long past. In the hand, a well-made sword makes you feel like you can stand against anything. But swords are not just long knives, they are a thing unto there selves. 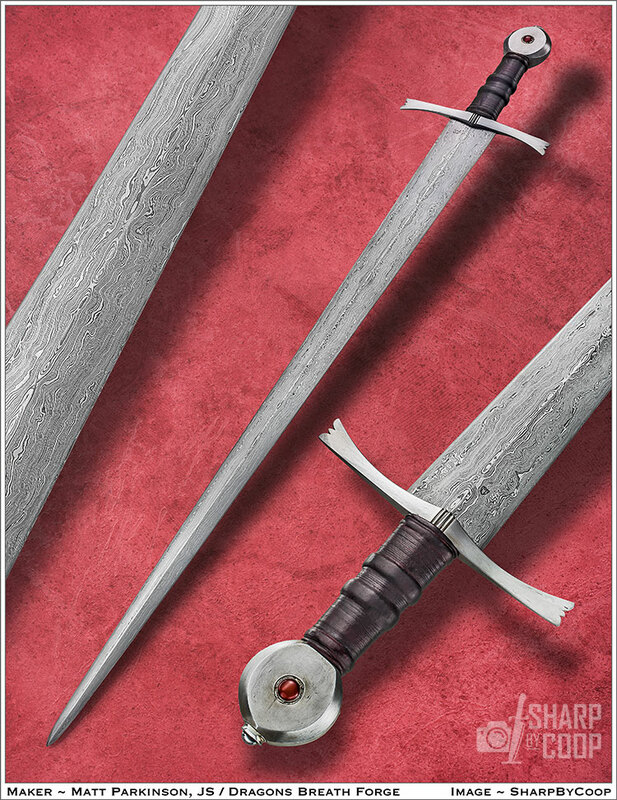 Swords were the highest technology of their time and were venerated like nothing else made. The smiths that forged these blades were and are a breed apart, this six day class will covering the basics of forging, grinding, heat treatment of swords blades along with the of fitting out the furniture. Something that can be a challenging and rewarding change from the more common knifemaking. The focus of this class will be an Oakshoot type XV or XVIII arming sword with a blade length of 26-29”. This class will use that lens to explore some of the subtler aspects of Swordsmithing including the basics principles of geometric design, along with sword dynamics and both how they effect to the performance of the sword and how they can be “tuned” Many of these same principles can apply to other kinds of work. Special attention will be paid to good sword design and construction using both traditional and some modern innovations. Blades will be forged from 1084 steel, with fittings from mild steel, a wooden core handle with a cord and leather wrapped grip. This is an intermediate level class and students will need to have some basic skill at forging as well as well as grinding and finishing. This class will be intense and a lot of work, but also incredibly rewarding and a lot of fun! Matthew was inspired as a child watching a Blacksmith work in a museum, this seemingly small moment stuck with him his whole childhood, latter as a young teen, under the direction of his grandfather he made his first knife from an old file inspiring him to make knives. These two moments began his long journey into blacksmithing and bladesmithing. Matthew has been a full time professional blacksmith and Bladesmith since 1998, He is a member of Dragons Breath Forge, along with Peter Swarz-Burt Jamie Lundell and Mareko Maumasi. Matthew began teaching in 2007 and has taught at NESM, Peters Valley school of Craft, the Guilford Arts center, the Brookfeild craft center, the Adirondack Folk School, as well as teaching in the FHP shop. Matthew's work has been featured in Blade Magazine, Knives illustrated Knife Magazine and Pirate quarterly. He was published by Knife magazine. In 2015 Matthew was a competitor on and won the first episode of “Forged in Fire” on the History Channel, making a Katana in 5 days that split a bullet. He returned to forged in fire in 2016 for a champions round and placed second making a Scottish Claymore that also split a bullet. In 2016 Matthew attained the rank of Journeyman smith in the American Bladesmith society.